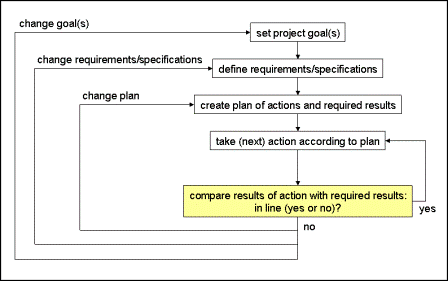 In project implementation phase we are doing the major part of the work of a project. Main goal of the project manager in this phase is to make sure that he stays in control of his project. Every work package shall cover the planned scope, and only that scope. All who contribute follow the planned schedule. Each work package remains within its planned budget. In order to stay in control of the project, the project manager - together with the whole team - will regularly compare the real work results with planned results. The following graphic illustrates this basic approach. (1) In order to be able to compare actual results with required results we need a plan that contains those required results. (2) In case actual and required results are in line with each other we continue with the next work package, task or action according to our plan. (3) Are actual results not in line with required results we might need to change the plan of the corresponding group of work packages, tasks or actions. For that reason we need change management procedures being agreed upon by all stakeholders. (4) Sometimes, changing the plan, is not sufficient. Then, we might need to change requirements or specifications of those results. This we can do only with the consent of all stakeholders. For that, change management procedures are helpful again. (5) In some rare cases this is still not sufficient, we might need to change the project goal or even terminate the project as a whole. This is the most serious situation for any project, and only clearly defined termination criteria will help to manage this situatuation.